As a national Coatings Contractor, all CSC Services operatives now hold SSPC Train the Painter – Gold level accreditation. Covering on site Health and Safety, protective coating application, spray painting and abrasive blast cleaning, the accreditation is fast becoming the industry standard for many UK organisations looking to appoint competent coatings contractors. As a national concrete and coatings contractor, this accreditation provides assurance to CSC Services’ clients that all operatives meet the highest industry standards, even when operating in risk inherent environments and confined spaces. The programme is accredited internationally by Lloyds Register and is fully endorsed by the Society for Protective Coatings (SSPC~). This scheme also meets the requirements of NACE No13/SSPS ACS-1, which is the joint standard for applicator training. This latest accreditation compliments a range of other specialist training including PASMA training, confined space training and abrasive wheels. CSC Services’ work in partnership with many of the UK leading coatings manufacturers and all operatives undertake all relevant application and product training. CSC Services are a Quality Approved Contractor for the Sika Liquid Plastics. 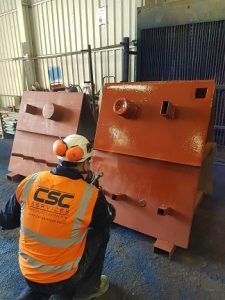 All of CSC Services’ operatives undertake regular training on the repair and protection of reinforced Concrete Structures in accordance with BSEN1504 which is approved by the Institute of Concrete Technology. CSC Services are full members of the Concrete Repair Association, demonstrating competency and experience in concrete repairs. All Supervisors hold SSSTS and SMSTS cards and all operative hold CSCS cards as standard. As a national Coatings Contractor, CSC Services also hold Gold level Constructionline membership, Acclaim SSIP accreditation, ISO 9001, ISO 14001 and OHSAS 18001 accreditations. Visit the About page of this website for full details. Please call 0191 410 344 if CSC Services can help with any coatings or refurbishment projects. The image shows the CSC Services’ operative undertaking the practical training programme.